In the first match, Durham University captain Alex Johnson had no hesitation in bowling first in overcast conditions. AUS captain Umar opened with Furqan, and the two started off well by attacking the new ball and putting the opposition under pressure. However in the sixth over with the score on 31, Jackson took two key wickets. New batsman Varun continued where Furqan left off by rotating the strike effectively. The spin-pace combination of Williams and Johnson put the brakes on the scoring- Williams (2-6 off 3 overs) and Johnson (2-8 off 3 overs). In the 14th over, AUS were only on 69. Hamza (27* off 15) hit a few lusty blows to take AUS past 100. AUS finished on 117/8 off their 20 overs. It was important for the AUS bowlers to start well, and they did exactly that. Durham University were not able to get off to a start, losing two quick wickets to Aqdab’s left arm seam (2-14). Hussam backed up his bowling partner well. Gibbon and PK started the recovery before the former was lbw to Salman (2-11), who also got Wright caught at mid-wicket. At the halfway mark Durham University were 41. Faizan then changed the game- getting the set batsman PK out for 34, and then removing the last three batsmen within two overs. He finished on 4/19 off his 3 overs. Durham University ended 18 runs short on 99. It looked close, but AUS were in control of the innings throughout. Captain Umar elected to bat in the second match against the second Durham University team, hoping to seal the series by racking up a big total. Unfortunately Furqan nicked off Stephenson’s (1-15) bowling in the first over. Umar then set about with some unorthodox hitting, and it was working- AUS were 37 after the first six overs. Durham University spin bowlers Dewhurst (2-16 off 4 overs) and Chandrasekhar (2-19 off 4 overs) came on after the PowerPlay, immediately bringing the scoring rate down. Umar continued to keep the scoreboard ticking over. However, he holed out in the 10th over off Dewhurt’s bowling. Varun played the anchor role but had no support. Raghavan (3-13 off 3 overs) and Jackson (0-10 off 2 overs) finished the innings off well, only giving away 18 runs in the last four overs despite the best efforts of the AUS tail. A total of 108 required another good start from the AUS bowlers, but unfortunately they could not repeat the heroics of the first match. Durham openers George and Marsden put on 45 in the first seven overs- George particularly severe on anything pitched up. Marsden was yorked by Faizan, giving Umar an opportunity to put the pressure on, but George was in a rich vein of form. Belton came in and immediately timed the ball well, and the two finished the match off in the 14th over- George 62* and Belton 22*. AUS Director of Sport Mohammed Helal presented the teams with the shared trophy after a good day of cricket. ‘It was a good opportunity for our boys to gain experience in foreign conditions and we hope to return here next year as well’ he said. AUS 118/8 in 20 overs (Umar 28, Hamza 27*, Williams 2-6, Johnson 2-8) beat Durham University 99 all out in 20 overs (PK 34, Faizan 4-19) by 18 runs. 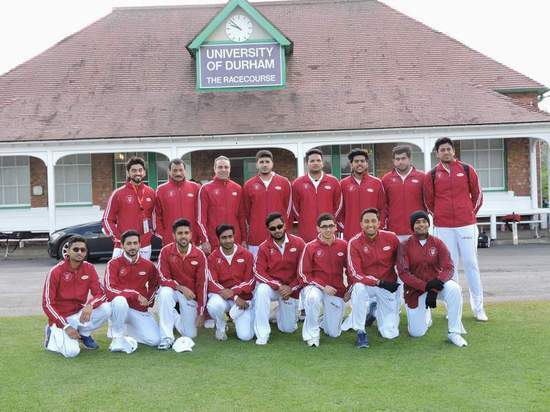 Durham University 109/1 in 14 overs (George 62*, Belton 22*, Faizan 1-21) beat AUS 108 all out in 20 overs (Umar 48, Raghavan 3-13, Dewhurst 2-16) by 9 wickets. Man of the Match: Rob George (62*).